The lines above would print the value of the $var variable to the browser's output and then stop program execution. While this can be used for debugging even a complex site, it makes the debugging a pain, because you have to type variable dump commands in your PHP source file, then refresh your web page in the browser to see the output, then edit the source file again, until you determine the reason of the problem. In contrast, when you debug your website in NetBeans IDE, the PHP interpreter pauses program execution flow at every line where you set a breakpoint. This makes it possible to conveniently retrieve information about the current state of the program, like the values of the local variables and the call stack. 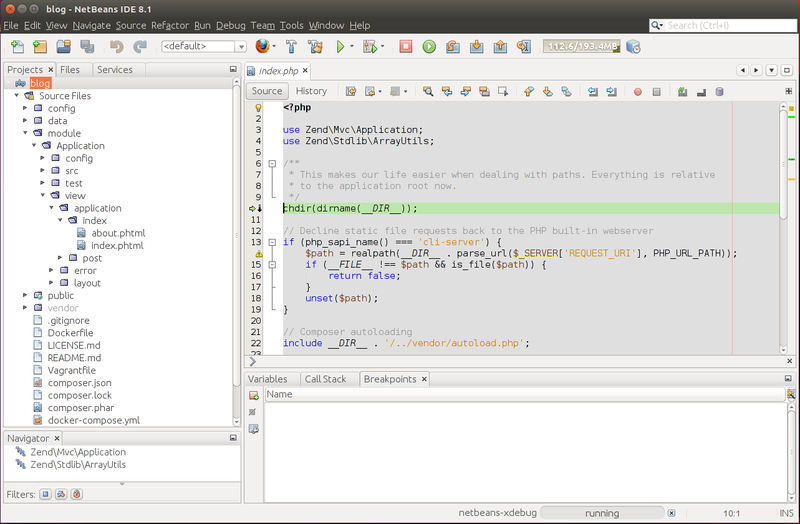 You see the debugging information in NetBeans window in graphical form. To be able to debug the site, you need to have the XDebug extension installed. If you haven't installed it yet, please refer to Appendix A. Configuring Web Development Environment for additional information on how to install it. To start the debugging session, in NetBeans window, click the Debug button on the Run Toolbar (figure B.4). Alternatively, you can press the CTRL+F5 key combination on your keyboard. While the program is in paused state, your web browser's window is frozen, because the browser is waiting for data from the web server. Once you continue program execution, the browser receives the data, and displays the web page.